Digital images can usually be divided into two distinct categories. They are either bitmap files or vector graphics. If you work in prepress, you need a good understanding of the advantages and disadvantages of both types of data. These pages try to explain the differences. As a general rule, digital pictures and scanned images are bitmap files. These are sometimes also called raster images. Drawings made in applications like Adobe Illustrator or Corel Draw are saved as vector graphics. Technically both data formats are completely different. The end result, however, can look virtually identical in either format. As a general rule bitmaps are typically used to depict lifelike images whereas vector graphics are more often used for abstract images such as logos. There are however numerous exceptions to this rule. It is often impossible to determine whether an image is a bitmap or a vector file just by looking at it. Vexel art, for instance, are bitmap images that have been manipulated to look as if they are vector data. The technique is used to create attention-grabbing realistic images that have an artificial and sharpened look to them. Talented artists like Yukio Miyamoto can draw photorealistic images using vectors. You can convert a bitmap image into a vector file. A vector image can be transformed into a bitmap. There are even file formats that can combine both types of data into a single file. Bitmap images are exactly what their name says they are: a collection of bits that form an image. The image consists of a matrix of individual dots (or pixels) that all have their own color (described using bits, the smallest possible units of information for a computer). 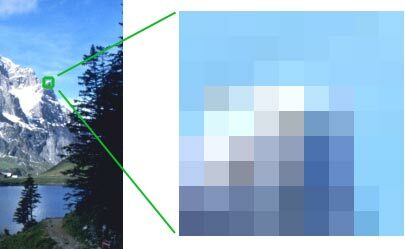 To the left you see an image and to the right a 250 percent enlargement of the top of one of the mountains. As you can see the image consists of hundreds of rows and columns of small elements that all have their own color. One such element is called a pixel – short for picture element. The human eye is not capable of seeing each individual pixel so we perceive a picture with smooth gradations. The number of pixels you need to get a realistic looking image depends on the way the image will be used. One of the next pages goes into more detail on this. Line-art. These are images that only contain two colors, usually black and white. Sometimes these images are referred to as bitmaps because a computer has to use only 1 bit (on=black, off=white) to define each pixel. Grayscale images, which contain various shades of gray as well as pure black and white.Typically 256 shades of gray (8-bit) are used even though the human visual system needs only 100 tints to perceive an image as life-like. Multitones: such images contain shades of two or more colors. The most popular multitone images are duotones, which usually consist of black and a second spot color (often a Pantone color). The example below contains black and Pantone Warm Red. Full-color images. The color information can be described using a number of color spaces: RGB, CMYK or Lab for instance. Bitmap data can take up a lot of room. A CMYK A4-size picture that is optimized for medium quality printing (150 lpi) takes up 40 MB. Compression can reduce the size of the file. The image with the enlargement showed one of the main disadvantages of bitmap images: once they are enlarged too much, they look unnatural and blocky. Reducing their sizes also has an impact on image quality as images lose a bit of sharpness. Bitmaps are fairly simple to output, as long as your RIP or printer has sufficient memory. There are hundreds of applications on the market that can be used to create or modify bitmap data. In prepress, one application – Adobe Photoshop – completely dominates the market. This doesn’t mean that cheaper alternatives like Corel Photo-Paint, should be disregarded. BMP: an outdated and limited file format that is not suitable for use in prepress. EPS: a flexible file format that can contain both bitmap and vector data. It is gradually being replaced by PDF. PICT: a file format that can contain both bitmap and vector data but that is mainly used on Macintosh computers and is not very suitable for prepress. Vector graphics are images that are completely described using mathematical definitions. The image below shows the principle. To the left, you see the image itself and to the right, you see the actual lines that make up the drawing. Each individual line is made up of either a vast collection of points with lines interconnecting all of them or just a few control points that are connected using so-called Bézier curves. It is this latter method that generates the best results and that is used by most drawing programs. This drawing demonstrates the two principles. To the left, a circle is formed by connecting a number of points using straight lines. To the right, you see the same circle that is now drawn using 4 points (nodes) only. Vector drawings are usually pretty small files because they only contain data about the Bézier curves that form the drawing. The EPS file format that is often used to store vector drawings includes a bitmap preview image along the Bézier data. The file size of this preview image is usually larger than the actual Bézier data themselves. Drawings containing trapping information can only be scaled up to 20 percent larger or smaller. Thin lines may disappear if a vector drawing is reduced too much. Small errors in a drawing may become visible as soon as it is enlarged too much. It is fairly easy to create a vector based drawing that is very difficult to output. Especially the use of tiles (small objects that are repeated dozens or hundreds of times) and Corel Draw lens effects can lead to very complex files. There are hundreds of applications on the market that can be used to create or modify vector data. In prepress, Adobe Illustrator and Corel Draw are the most popular programs. EPS: the most popular file format to exchange vector drawings even though PDF is quickly gaining ground. PDF: a versatile file format that can contain just about any type of data including complete pages. PSD: the native file format of Adobe Photoshop. AI: the native file format of Adobe Illustrator. If you scan or photograph a logo, it is a bitmap image. If it is going to be used often in a layout it is more practical to have that logo as a vector drawing. That reduces its file size and you can change the image size without worrying about any loss in quality. Vector drawings often have to be converted to bitmaps if they will be used on a web page. Vector drawings are sometimes too complicated for a RIP to be output on film or plate. Converting them to a bitmap simplifies the file. From bitmap data to vector graphics: the process to convert a bitmap image to vector data is called outlining or vectorizing. Some drawing applications such as Adobe Illustrator and Corel Draw have this option built in. There are also separate programs available to vectorize bitmap images. For simple jobs the easiest solution is to put the bitmap image on the background of the canvas of a drawing application and manually draw over it. Many drawing applications can store vector data as bitmap files as well (usually this option is hidden in the Export menu option). You can always view a vector file on screen, then take a screen capture and save this screen capture as a bitmap image. Photoshop can open some vector file formats and rasterize the file so that it becomes a bitmap file. A pop-up menu allows you to define the resolution and color mode of the bitmap data. Excellent knowledge my friend! really helpful towards me and my classmates. I create bitmap and vector images too..but your post is so inspiring with all of those details..That is Great!! so complete and readers like me will be enjoying those texts and pics! the artwork from yukio,is that real vector drawed or that is created by photoshop effect? thanks again for all your infos here! I have been asked that all the hi-res.tif photos in a print brochure I am making be placed as .eps files before sending to print. The request took me by surprise. I told the client it is standard practice to place photos (bitmap art) as .tif files for 4-color printing and use .eps files for graphics. They said .eps files were required for all placed art. For over 10 years of preparing files for print, I have never encountered the request to convert bitmap .tif files (photos) to .eps for placement. Is this something new or an odd pre-press practice I don’t know about? Or, should I emphasize the point that is it not necessary to convert the hi-res .tif files to .eps. The hi-res photo art will print fine as .tif files. The brochure is text and photos only. Thanks for any input! Very educational page on vector vs bitmap files you have here. Thanks for the thorough explanations. Vector graphics I saw was way back 1980 when arcade games exploded on the seen with Asteroids being a notable early big blockbuster. Then a game console called Vectrex came out. So vector graphics have hung around for good reason. I started using ray tracing software on mymates Amiga 3000 with a 24 bit graphic card and interace monitor. OMG amazing rendering but very work intensive and even overclocked and with a maths co-pro fpu and 2 computers computating, it took overnight for a 3d 24 bit sphere to be created. On my computer it took more than 5-10 mins to display on the screen. You can change bitmap to vector using trace algorithms, or by manually re-drawing the bitmap in vector format. I fount http://www.creattor.com usefull for getting bitmap stock files to transform to vector. You’ve said “you can,” but you didn’t say how. I have bitmap files and I’m looking to convert them to vector. How is this done? Is there a free converter available on the net? I have drawn abstract art work on a very basic software-Paint. The pics are complicated and cannot be individually drawn by another. I have saved the art work on my PC in a jpeg format. I want to reproduce the art work in a larger size for matting, framing and sale. The first jpeg enlargement was poor in quality so I suspect I need to convert the jpeg format discs to a vector format. There are over 60 drawings on each disc, (2) discs. Is there a conversion software that will convert all that data at once from jpeg to a vector format for enlargement purposes? I am real dumb when it comes to computer software as you can tell. I used Paint-software to begin with because it is what I had and when I started drawing I just went crazy with it. I will purchase a better software for future drawings. Thank you, thank you. Very clear. I always wish i could turn photography into a decent illustration. Know any tricks? Hey Rob … seems like a lot you’re asking .. surely offer Laurens a commercial rate for supplying? I am a sailmaker and my sail design program outputs a picture of the sail in Mac .pict format. The sail is made up of a number of panels, each of which are numbered. I need to convert this to a vector format so that it can be scaled and then each individual panel chas to be traced and html tagged.and then recompiled. The purpose of this is so that customers can colour in their own colour preferences on my website and send this back to me. As there will be different sail pictures for different sizes of sails this could involve quite a large number of drawings so it will be very time consuming. Could you suggest a quick way of doing this? I can send you an example of what it looks like. is really good thank you. How can i convert vectors to bitmap? Am stuck guys…..
Real the article has helped me and i like it thanks for a good job. I have learned something new today .Thank you . I explained the differences between bitmap (raster…pixel) images and vector images in a video I did a while back. What is the name of the video and where is it ? hi, pls give me the strength of vector drawn graphic?i’m not very clear with this.tq as soon as possible k..
you say that “You can convert a bitmap image into a vector file. A vector image can be transformed into a bitmap” but on ur previous link you said that only vectors can be converted to rasters, did u make a mistake or did i misinterpret? p.s. i found the web helpful! Has any one ever come across a form of CT/LW file that contains three parts, .exc .ct .lw? The image with the enlargement showed one of the main disadvantages of bitmap images: once they are enlarged to much, they look unnatural and blocky. But reducing a picture too much also has a bad influence as it looses sharpness. You used a word that does not exist. Inlarge should be > enlarge. Thanks for allowing me to correct you while you were correcting her. Very informative and useful site for non IT/ techi people. Thanks so much for taking the time to impart your knowledge. But beneath the headline “File formats that are used for vector data” on this page [http://learnonline.nku.edu/webapps/portal/frameset.jsp?tab_id=_2_1&url=%2fwebapps%2fblackboard%2fexecute%2flauncher%3ftype%3dCourse%26id%3d_69306_1%26url%3d], it switches to bitmap information. the above imformation is really good and helpful for me to understand the difference between BMP and vector graphic images. I really need more about the bitmap images as i need to give a project on the image processing under the C language so what ever you have got please mail me . Sorry, I simply don’t have the time to help everyone with their school projects. nice, i’m looking for this. A post about vector..! It tells me everything that i need to know about bitmap images. … U haven’t given me any examples!!!! I would like 2 c images comparing vector and bitmap graphics! Hey Wiseman, thanks for pointing out that some of the images on this page were missing. I have added them again and also included an example that shows how difficult it can be to distinguish between vector and bitmap images. In IT bitmap is a picture in a file format used for representing and storing graphics on a number of operating systems. It has a number of grids of pixel and it is shaped. There are many file formats for example, bmp, pcx, tiff and gif and so on. These file formats gives you a good view of the created edge lines. Bitmap images are used by all computers and all the information for all windows operating systems uses bitmap.